Let’s face it: Not that many people step back into the 16-bit world these days. The sophistication of today’s consoles has opened doors and created so many opportunities for music to expand in the gaming world in ways that most would have thought impossible. Inevitably, the Super Nintendo days are becoming forgotten, fading away into the past, only kept alive by the odd emulator, and thankfully, beautiful albums such as the Bahamut Lagoon Original Soundtrack. This is a strong representation of the Super Nintendo’s capacity, representing Noriko Matsueda’s and sound programming Hidenori Suzuki’s constant battles against hardware limitations as the 16-bit era approached its end. Each theme is lovingly rendered, tamed to please the listener, and enhance the game’s atmosphere, and, while it may not compare technically to albums of today, it remains an underappreciated Super Nintendo classic. With militaristic vibes running throughout the soundtrack, the album starts off with the awe-inspiring “Opening,” a track that will satisfy just about anyone’s creature comforts. Strings play a flowing melody to a brass accompaniment that soon becomes the main feature of the track, just before it shifts to the dominant key. Here we see the birth of a quaint, patriotic section led by the strings. Matsueda wraps everything up tightly here as the theme spirals into something even more grand. This theme is also synthetically orchestrated in a conservative yet epic manner by Takahito Eguchi for the bonus second disc of the album, which enhances its qualities greatly, and receives an expansive in-game variation in “Rebel Army,” an upbeat theme filled with glorious peaks. “Rebel Army” is tailored by Matsueda, who carefully threads her melodies together in an attempt to get that one last sparkling button fastened into place, it is only the melodic line that receives any great treatment here, but that is all that is needed. The other army themes are also treated very differently. “Orerusu Salvation Army” creates an image of an army of toy soldiers, or perhaps something from Kodaly’s Harry Janos Suite thanks to the sharp precise synth that plays the primary melody, while “Granbelos’ Imperial Army” has a greater action orientation than the rest of the army themes, ideal for representing the dark army, and, while it largely feels like a light battle theme, there are some truly sinister moments featured. The character themes are also undeniably varied in nature, ranging from the downright inspirational beauties to the edgy and militaristic. “Sauzer’s Theme” and “Matelite’s Theme” are very similar, with both themes using militaristic instrumentation while featuring a fragmented and beautiful melodic line, essentially representing the quest of innocent warriors. “Guldorf’s Theme” offers a percussion line, suspended chords, and certain other features that are highly reminiscent of Gustav Holst’s “Mars, the Bringer of War”; it is not without beauty, but clearly reflects a sinister force that will undermine the world, even if through a hackneyed format. Protagonist and antagonist introduced, the themes used to represent Jojo are among the best tracks on the album, being both inspirational and well-developed. “Jojo and the Sacred Dragon” is superior to “Jojo’s Theme,” featuring some profound rhythmical and instrumental contrasts, though both themes are excellent. It is also one of the two themes that is pseudo-orchestrated for the bonus second disc, enhanced wonderfully by Gizaemon de Furuta, who also created the string and horn part for the Chrono Trigger: The Brink of Time‘s “Undersea Palace.” Starting with a quaint oboe line, lovingly licked by a bassoon part, the arrangement blooms when a refined string section becomes evident. 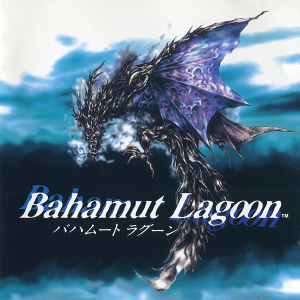 In comparison to the other arrangement, Eguchi’s “Theme of Bahamut Lagoon ~ Opening,” de Furuta’s theme may not be as grandiose, but it certainly is an improvement upon the original theme, drastically limited by the console’s sound capacity. Although the approaches to few themes are unprecedented, their refinement and collective diversity makes the album much more appreciable. The setting themes are a highlight in this respect. As some examples, “The Green Continent Campbell” is a relaxing theme that generates so many images of nature and its glorious miracles, “The Water Continent Maharl” utilises water-like synth and other interesting instrumentation to emphasise the nature of the continent, and “Desert Daphira” is perfectly mastered by Hidenori Suzuki and features some appropriate sand sound effects. As for the town themes, “Magical City Godorando” is most notable, featuring an instrument of Indian origin to create an image of an enchanted city with oriental vibes. The album is rather dark in places too, adding to the emotional variety. “Monsters” and “Altyre’s Monsters” are interesting stereotypes — the former being the typical tension-creating theme with shock discords, eerie pauses, and crisis motifs, the latter being much more random and chaotic, highlighting a sense of action and unpredictability with its avant-garde leanings. Perhaps the strangest theme is “Boss Battle,” which features one of the most random bass lines out there that supports a melodic line that would be an incoherent and uncoordinated mess were it on its own. With its trotting rhythms, regular octave leaps, and sinister and temperamental tones, it manages to be fun, tense, and quirky all at the same time. The conclusion to the soundtrack is of the quality most would anticipate from an early Square soundtrack. “Battle with Alexander” is a classic penultimate battle theme, featuring a cluster of discords that work superbly together, as well as an enticing melody. The timpani line in the background of the track is another key feature too, contrasting with the album’s other percussion-led tracks in that it doesn’t maintain a steady tempo, but makes the theme constantly sound as if it wants to rush on with its rapid yet repetitive beats. The next theme, “Decisive Battle!,” is just one of those final battle themes that captivates during gameplay; it sings out so loudly and with such passion that it almost steals the show on the spot, but just about manages to convert all its mixture of aggressive and positive energy into enhancing the game. Though there is only a single ending theme, it is developed to be the most comprehensive track on the album at six minutes in total. Among the best available on the console, even giving the likes of Chrono Trigger‘s “To Far Away Times” and Final Fantasy IV‘s “Epilogue” a run for their money, it starts off subtly and gradually thickens with the delicate addition of various instruments until the metamorphosis into an action-packed section with much flair is complete. This theme ends the album, and the game, in the best way possible, including a fine reprise of the main theme along the way, and is unbelievably rich musically and emotionally. The Bahamut Lagoon Original Soundtrack is one of the richest imitative orchestral SNES soundtracks available and a strong addition to Noriko Matsueda’s discography. While it suffers from total lack of harmonic variation, which can be rather tedious after forty tracks, the strength of the melodies, diversity of the instrumentation, and overall emotive nature of the score ensure this isn’t especially significant. It isn’t quite as good as Matsueda’s other major pseudo-orchestral effort, the Front Mission 2 Original Soundtrack, less profound musically and less refined technically, so it’d be advisable to perhaps consider said album first, though both are extremely worthwhile. Now out-of-print, eBay and the Marketplace auctions at Chudah’s Corner are the only major sources to obtain a copy; it may, however, be worth it, especially if one is fond of traditional SNES RPG soundtracks with a militaristic vibe. It is a respectable effort that is worthy of being cherished from a underappreciated composer. Posted on August 1, 2012 by Dave Valentine. Last modified on January 22, 2016.